The Gallery of the Uffizi is an Italian, situated museum in the Large square of the Uffizi to Florence. The building among other things accommodates an arrogant collection of works of art, comprising the greater collection of paintings of the Botticelli, uniform in several knows prepared them for schools and styles in chronological order. It is one of the more famous museums of the world for its extraordinary collections of paintings and ancient statues its collections of paintings of the 1300's and the Rinascimento contains some absolute capolavori of the art of all the times. Enough to remember the names of Giotto, Simone Martini, Piero of the Francesca, Angelic Blessed soul, Filippo Lippi, Botticelli, Mantegna, Correggio, Leonardo, Raffaello, Michelangelo, Caravaggio. Important are also the collections of German, Dutch painters and fiamminghi. Between these: Dürer, Rembrandt, Rubens. 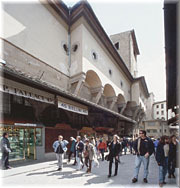 The Gallery is situated to last slowly of the great building constructed between 1560 and 1580 on plan of George Vasari like center of the main offices trained you of from Tuscany state. It was realized for will of granduca the Francisco and enriched thanks to the contribution of numerous Medical members of the family, gets passionate collectors to you of paintings, sculptures and objects of art. It was reordered and widened under the dynasty of the Lorena, succeduti to the Doctors, and later on from the Italian State. On the whole vasariano important collections are ospitatate others: the Collection Contini Bonacossi and the Cabinet Designs and Press of the Uffizi. 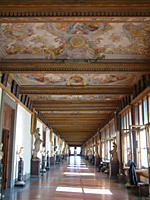 Vasariano corridor: a corridor suspended realized from the Vasari in 1565, connects the building of the Uffizi with Old Palace and Palazzo Pitti. 1600's collections of paintings of and collection of Selfs-portrait are exposed to you to important.